This is Michael’s story. It’s a story about how a 16-year-old boy cured an incurable disease that can hit anyone at any age. It’s a story about his dad’s unfailing faith in the ability of the human body to heal itself. It’s a story about how you can cure even incurable diseases if you look for the cause. It’s also a story about how simple it sometimes can be — I treated this case over the telephone. Michael’s dad, licensed both as a Naturopathic Doctor and a chiropractor, called me a few years ago. He came right to the point. “My son, who has been healthy all his life, is in serious trouble, and we need some help. I’ve tried everything I know. He was very healthy until he went to Mexico five months ago. But shortly after that trip he started to have bowel problems. The gastric specialist performed a colonoscopy, and recorded in Michael’s medical records that his intestinal mucosa (the tissue that lines the intestines) was inflamed, swollen, highly irritated, and bleeding. He took a sample of the mucosa for a biopsy, and then reported to his dad that the most likely diagnosis was Crohn’s disease. In a few days the biopsy was back, and it confirmed the Crohn’s disease diagnosis. For those of you who aren’t familiar with this terrible disease, Crohn’s is an autoimmune disease. It is caused by the immune system attacking the gastrointestinal tract, and slowly destroying it. It is classified as an inflammatory bowel disease because of the inflammation it causes. 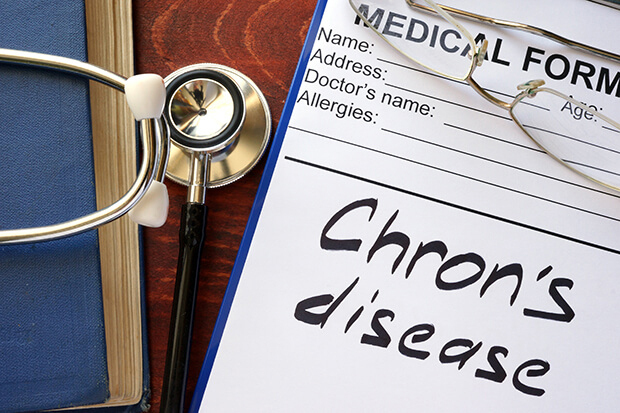 Conventional medicine states that the cause of auto-immune diseases is unknown, but the fact is that it is usually the result of allergies – usually an allergy to an infectious agent like a virus, parasite, or bacteria, and occasionally an allergy to a food. Although auto-immune diseases are not genetic in the strict sense, the tendency to develop the allergies that cause them is genetic. So if you have a family member that has an auto-immune disease, the other family members are more likely to get it than the general population. No doubt Michael had picked up some kind of infection when he was in Mexico that, because of his genetic predisposition, caused his immune system to attack his own body. Crohn’s disease is a serious problem. Over 500,000 people in North America alone have Crohn’s. In Europe, three to five people out of every 1,000 have Crohn’s. And it can strike at any age. For the first two weeks, I put Michael on a very low carbohydrate vegetable and meat only diet. This is because many of the bacteria and fungi that cause intestinal diseases depend on carbohydrates for survival. • UltraInflamex 360 — This is a protein based powder produced by the company Metagenics. They formulate it with herbs to reduce the inflammatory response in the intestines. He took two scoops twice a day. • Grapefruit seed extract — He took 10 drops, three times per day. This is an excellent remedy for intestinal infections. • Terbinafine 250 mg (this is a very safe, anti-fungal prescription medication) – one tablet once a day for three weeks. • Pro Bio Gold (a probiotic from Kirkman labs) — four capsules, two times daily. • Saccharomyces boullardi (a probiotic that is especially effective for Candida) — one capsule, two times daily. These remedies will kill most of the abnormal bacteria, fungi, and parasites that Michael’s immune system was allergic to. • Ozone water — I had Michael drink eight ounces of ozonated water during the course of each day. In addition, I also had him take an ozone enema every day. Ozone therapy is one of the most remarkable alternative therapies out there for auto-immune diseases. Doctors can learn how to use this treatment on their patients by coming to one of my three-day seminars on the use of ozone in medicine. You can find seminar dates at www.shallenbergerozonecourse.com. • EPA-DHA 6:1 — two capsules, twice daily. This is a special formulation of fish oil that contains a preponderance of EPA (eicosapentaenoic acid). EPA is the component in fish oil that has the largest anti-inflammatory activity. This is another Metagenics product. • Hydrocortisone (10 mg) and DHEA (25 mg) — I instructed Michael to take one of each at 8:00 a.m., noon, and 3:00 p.m. These are the primary adrenal hormones that the body uses to regulate the immune system response. When these hormones are deficient, allergies develop as a result. 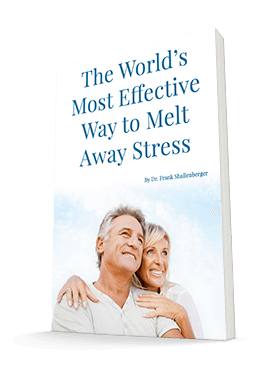 The stress of Michael’s prolonged illness had exhausted his adrenal glands. As a result, they were not able to provide his body with enough of these critical hormones. This intensified the disease process, and made his condition worse. • BHI Intestines — He took one every one to two hours. He alternated each day with BHI Diarrhea. These homeopathic preparations, manufactured by BHI (Biological Homeopathic Industries), contain remedies that work on the emotional system. For example, colocynthis is very effective for bowel disorders brought on by feelings of guilt or inadequacy. Crohn’s is not an easy disease to treat, so it took a lot of different treatments. I would much rather have given Michael only one or two remedies. But that’s just not how the human body works. It has many systems that are affected by disease. And all of them have to be treated in order to get the best results. Healing the human body of disease is like putting together a picture puzzle. Unless all the pieces are in place, you won’t be able to solve the puzzle. His treatment program had components that decreased inflammation, eliminated infectious agents and toxins, regulated the immune system response, increased vitality and strength, and treated the emotional component. This sounds good in theory, but does it really work? After a couple of weeks, I talked with Michael’s dad. I prescribed nandrolone deconate injections — 200 mg every two weeks. This is an anabolic steroid that would prevent him from losing any more lean body mass, and would help him maintain what little strength he had left. Then I told his dad that as soon as Michael was up to it emotionally, have him startup all of the remedies I had prescribed. Two weeks later I talked with dad again. This time things were better. Michael had gained 10 pounds. This was the first time in over four months that he had done anything other than lose weight. He was feeling better, and best of all, he had started the program I originally put him on. I instructed his father to very slowly decrease the prednisone dose as he started to recover. Four weeks later things were even better. The loose stools had stopped. The bleeding had also stopped. His iron levels nearly doubled. And his blood markers of inflammation had declined dramatically. His albumin had increased from his previously dangerous level of 2.5 g/dL to 3.3. He was able to decrease his prednisone dose to only 20 mg per day, and he was feeling good. At that point I gave his dad instructions on how to systematically reduce the prednisone dose. Now that he was taking supplements well, I added n-acetyl cysteine (500 mg, twice daily) and l-glutamine (3,000 mg, twice daily). These amino acids are very effective at reducing toxicity in the intestines and the liver. And I cautioned him, “Don’t stop anything! You are not out of this yet. At this point, much of your improvement has been from the prednisone drug. You won’t be able to call yourself cured until you are off that drug for at least two months.” I could only hope that he would follow my advice. Two months later, we talked again. He had gained another 24 pounds, and his strength had completely returned. In fact, his dad told me that he had just come back from surfing in Hawaii. Now that we had treated the causes for his disease, his own adrenal glands were able to make all the hormones he needed, and no longer required the adrenal treatments. So we stopped the adrenal therapies, but continued everything else. Like so many other patients, Michael had been cured of a disease that is supposed to be incurable. And all this was done naturally, without one side effect. Drugs can be helpful, but they are not the answer. Working with the body’s own healing systems is what works. Once again I warned Michael’s dad not to let him go back to his old ways, or the likelihood was that the Crohn’s would come right back again. I encouraged him to make permanent changes in the way he ate, and in the way he dealt with stress. Only then will he be permanently cured. Michael’s case is a case of hope. For all patients and their doctors who are struggling with “incurable” diseases, Michael’s story should encourage them to keep looking for answers. God created your body to heal itself. All you have to do is to help the process along. For more insights on chronic bowel disease, read the remarkable book Breaking the Vicious Cycle by Elaine Gottschall. This book is filled with outstanding information on how to cure many chronic so-called incurable bowel diseases with diet alone. And the fact that her work is so successful should emphasize to everyone that one of the major causes, perhaps the single most influential factor in all bowel diseases (including Crohn’s), is our pathetic Western diet.